Saturday morning, 30 August 2014, was a perfect time for shorebirding at Jamaica Bay Wildlife Refuge’s East Pond. The high tide was set for late morning so I could take my time getting out there, the sun was going to be out providing enough light for some good digiscoping, and we had a three-day weekend so I could spend more time than usual without really shorting my family. And, happily, the shorebirds even remembered to show up! From my initial entry onto the East Pond at the south end I was immersed in shorebirds. There was a small horde of peeps present, mostly the expected Semipalmated Sandpipers and Least Sandpipers but there were several White-rumped Sandpipers and a couple Western Sandpipers as well. But the one I wanted to see, a young Baird’s Sandpiper that had been around, was nowhere to be found. While frustrating, it wasn’t too bad enjoying the birds that were there! I can never resist taking pictures of young Least Sandpipers. And I never want to either. 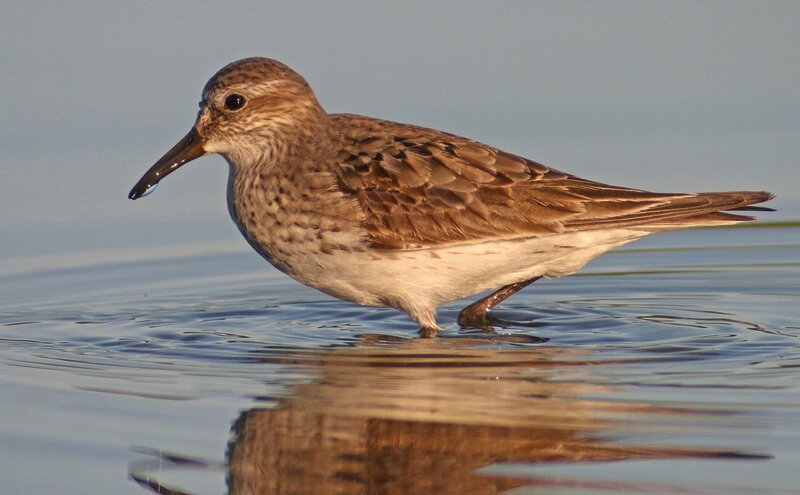 This is the same Western Sandpiper as in the picture at the top of the post. Cooperative is one word that could be used to describe it. Crushed is another. It is wonderful to have shorebirds at your feet and nowhere is better for that than the East Pond. Though the size and structure (Look at that primary extension!) of this bird made it an obvious White-rumped Sandpiper it is always good to be close enough to see the orange at the base of the lower mandible to be absolutely sure. The white rump would have worked too but this bird had no interest in flushing. 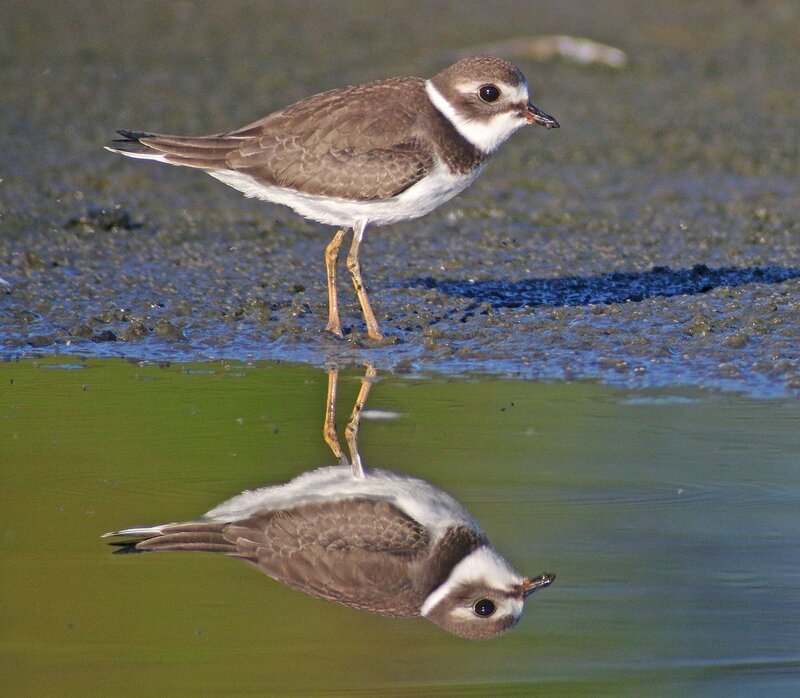 Semipalmated Plovers are nice, particularly the youngsters. Not as nice as a Common Ringed Plover would be but still nice. After tearing myself away from the peeps and plovers I found myself at the Raunt, which is the first good stopping spot north of the south end. Short-billed Dowitchers took my attention here. Almost all of them were juveniles and they also did not want to move away from me. The Short-billed Dowitchers were cool with me but not with each other. This aggression came out of nowhere for seemingly no reason. I spent a ton of time digiscoping preening and bathing Short-billed Dowitchers. It’s amazing what contortionists they are. There will be a gallery post soon! When I finally took myself away from the dowitchers I scanned north and spotted a young Bald Eagle feeding on a duck. As I watched it took off and flew a bit north on the pond and hid behind some reeds. I kept that in mind as I continued north through a zone of no shorebirds, probably spooked by the giant predator that had been there. So I picked up the pace a bit even though I was in a bunch of pretty squishy mud. Then my right boot got stuck and my forward momentum carried my sock-clad foot right out of the boot. I tried to get my tripod down to catch my weight but it was too late. My foot went into the mud. Grossness. Then I had to get my foot out of the mud and back into the boot all while not falling over or dropping optics into the goop. I managed to get it done but in the process kicked up some mud into the other boot too. Now both feet were covered in mud inside of my boots. There was nothing for it but to continue north and look for more birds! During my struggle some peeps had landed a short distance ahead of me. I almost blew past them but decided to give them a scan. Good decision! 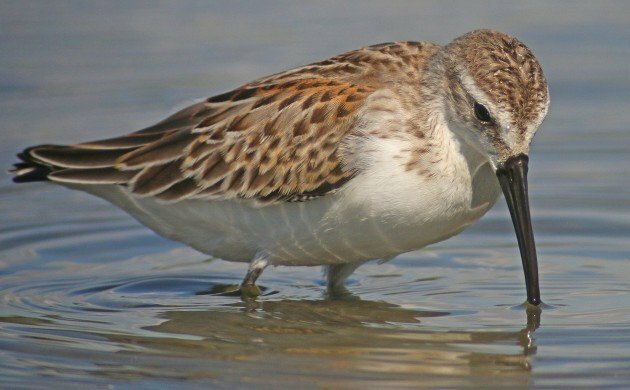 Baird’s Sandpiper! Look at this beautiful youngster. The white fringing on the back. The nice tan face and neck. To think that it was born in the arctic this spring and is heading for southern South America, which it will reach before it is six months old, is astounding. 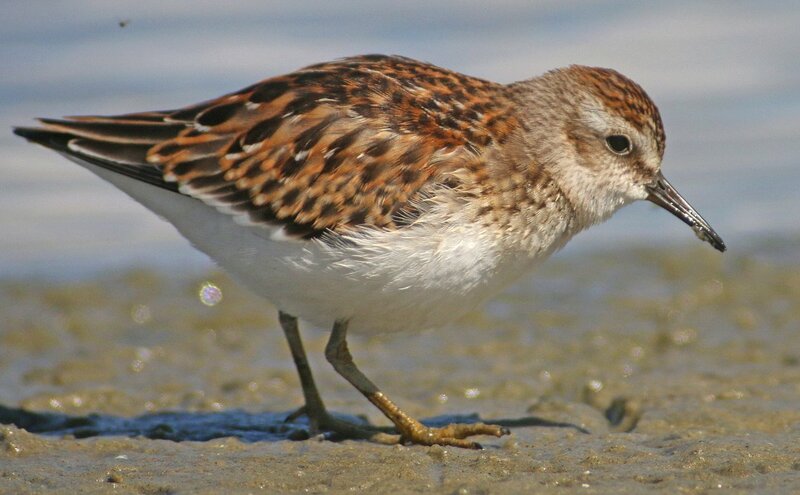 Good luck, little sandpiper! 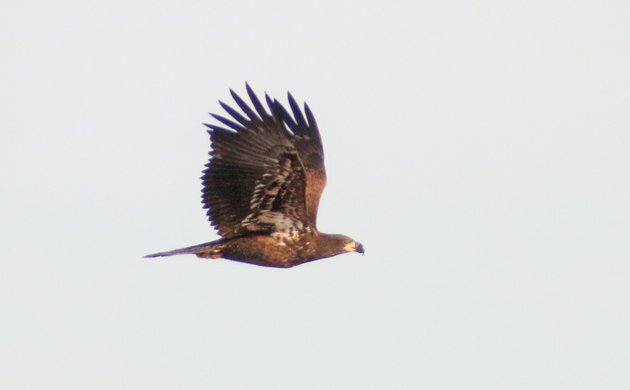 Then the eagle took off from where it was hiding and all the shorebirds near me skedaddled. I was pretty sure that the Baird’s had gone north and across the pond but I wasn’t positive. Then again, I wasn’t too concerned because I had seen and digiscoped it and I had an eagle to look at. Bald Eagles have recovered from the devastating effects of DDT and are getting easier and easier to see in Queens. Continuing up the east side of the pond I stopped to scan across the way to the west side where a bunch of peeps were feeding. 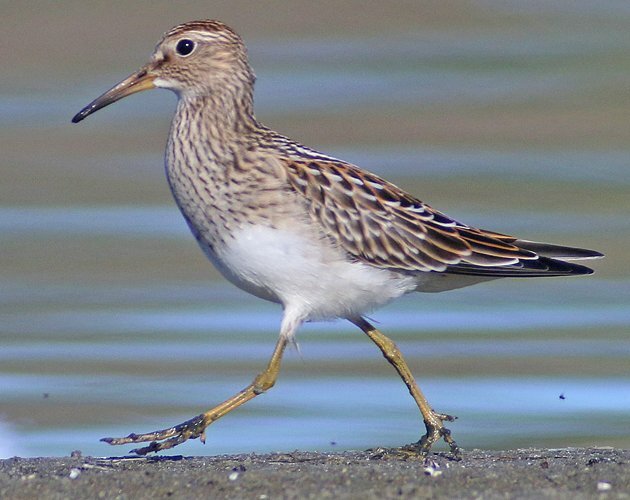 A Pectoral Sandpiper is always nice to see and it was even nicer when, seconds after I spotted it, it flew across the pond and landed directly in front of me. This was becoming ridiculous! 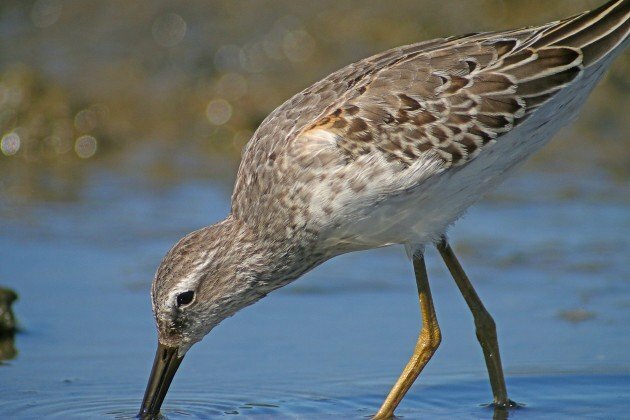 If I saw juvenile Pectoral Sandpipers as frequently as juvenile Least Sandpipers and juvenile Short-billed Dowitchers they would probably be in the competition for my favorite shorebird. What’s not to like? 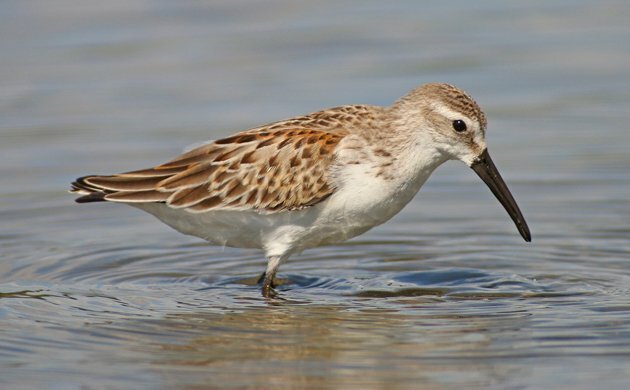 Continuing north, I received a phone call from Gail Benson to let me know that she and Tom Burke and Pat Lindsay and Shai Mitra were on there way and were wondering if I still had the Baird’s Sandpiper. Uh-oh. I started searching for it again, hoping to have it in my scope when they arrived. Despite all my efforts I could not refind the bird. It was more than a little bit frustrating. The four aforementioned birders arrived at the north end and started making their way down the west side, scoping as they went. I continued north on the east side, also scoping as I went. Finally, I found the sneaky little Baird’s Sandpiper on the rocky peninsula sticking off the south end of the island that dominates the middle of the north end of the pond. I called across the pond and received the thanks of my fellow birders. Good birds are made better when you can others on them! Not as good as my first look but, still, Baird’s Sandpiper! Eventually, it was time for me to head back down the east side though I continued to look for birds as I went, of course. I was very pleased to get a surprise Black-billed Cuckoo in the trees bordering the pond, only my third ever in Queens, though it was my second of the year. It didn’t cooperate well but one of the five Northern Waterthrush for the morning did. 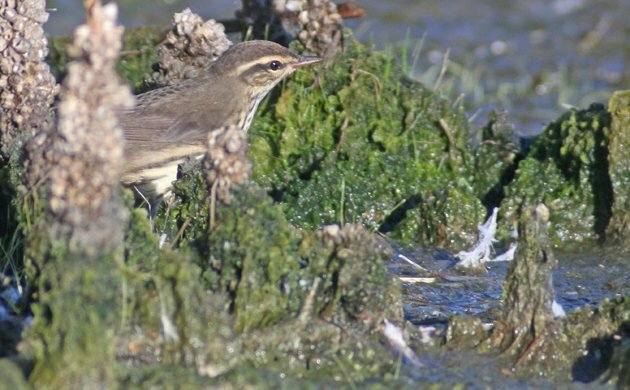 On the East Pond in summer Northern Waterthrush become honorary shorebirds. Once I got back to the Raunt I was happy to see a Stilt Sandpiper that had no problem allowing me to sneak up next to it for some pictures. Cooperative isn’t even the word! It is not every day that you get to see a Stilt Sandpiper this well. This image, believe it or not, isn’t even cropped. This is what I was looking at through my viewfinder. So nice. Getting video of the Stilt Sandpiper was fun too. Check out that feeding motion. Once I tore myself away from the Stilt Sandpiper I headed off of the pond and back to the Visitor Center (pausing along the way to give Jeff Ritter directions as to where the Baird’s Sandpiper was last seen) where I carefully washed my boots and feet off, throwing away the socks which were beyond saving, and got myself a cold drink of water. Then I packed up my car to head home. For some reason I checked my phone, where I saw that I had missed three calls from Tom Burke. Oh no! What had I missed! I called Tom back to learn that six Hudsonian Godwits had put in at the north end. I had to go back out onto the pond! I drove up to the parking lot by the North Channel Bridge, got my gear back out, put my boots back on my now bare feet, and hiked into the north end of the East Pond. 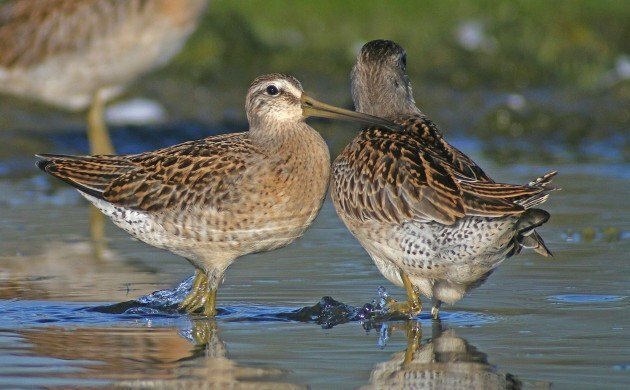 Aaah, Hudsonian Godwits! Six was the most I had ever seen in one spot. 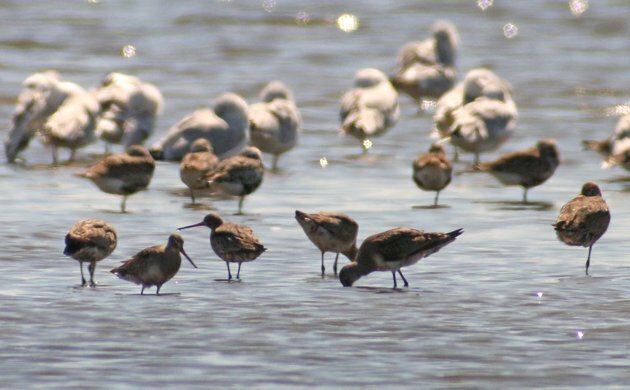 The light was against me but, still, six Hudsonian Godwits! I paused for a bit where Peter Dorosh and four other birders whose names I failed to get were watching the godwits. Then I checked the peninsula where the Baird’s Sandpiper had been and, sure enough, there it was. 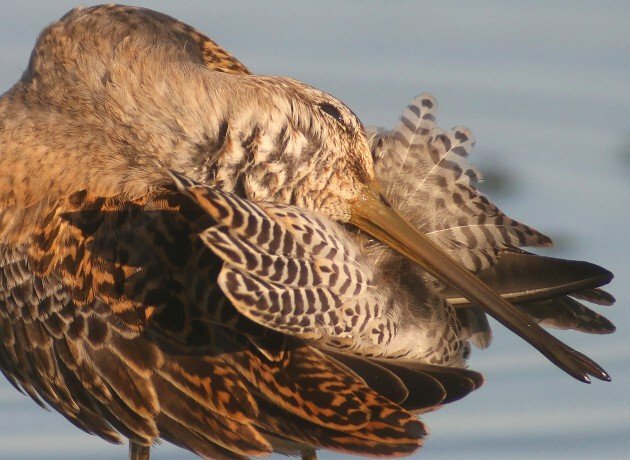 I called Jeff who was across the pond and let him know, but he was already on the bird, and I let the other birders watching the godwits know. Then I headed further south to say thanks to Tom and company for letting me know about the godwits. That doing so also put the godwits in better light was a happy outcome. Four of the six Hudsonian Godwits. Now that’s a nice way to get a year bird! With Greater Yellowlegs, Lesser Yellowlegs, Red Knot, Black-bellied Plover, and Ruddy Turnstone my shorebird count for the morning got up to fifteen, which is certainly respectable. 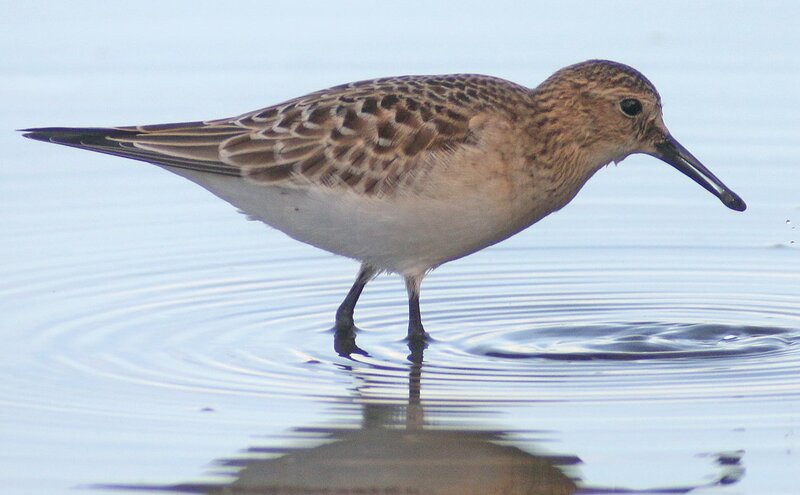 More respectable was a second Baird’s Sandpiper showing up to join the first. Once things reached that level of shorebirding I decided that things couldn’t get any better and headed off the pond and home. The blisters on my feet from wearing my rubber boots barefoot was a small price to pay for such a great morning’s shorebirding. Wouldn’t you agree? By the way, all of the images in this post were digiscoped that morning. Where else can you get this many shots of shorebirds in one morning? Thanks for sharing the great photos and detailed id tips. Those are very helpful. Hate those boot blisters! Fabulous photos! I’d never even heard of the Stilt Sandpiper, and it’s lovely. The Semipalmated Plover photo with reflection is amazing, too! What a wonderful morning’s shorebirding – worth the mud and blisters! You certainly got some beautiful images. 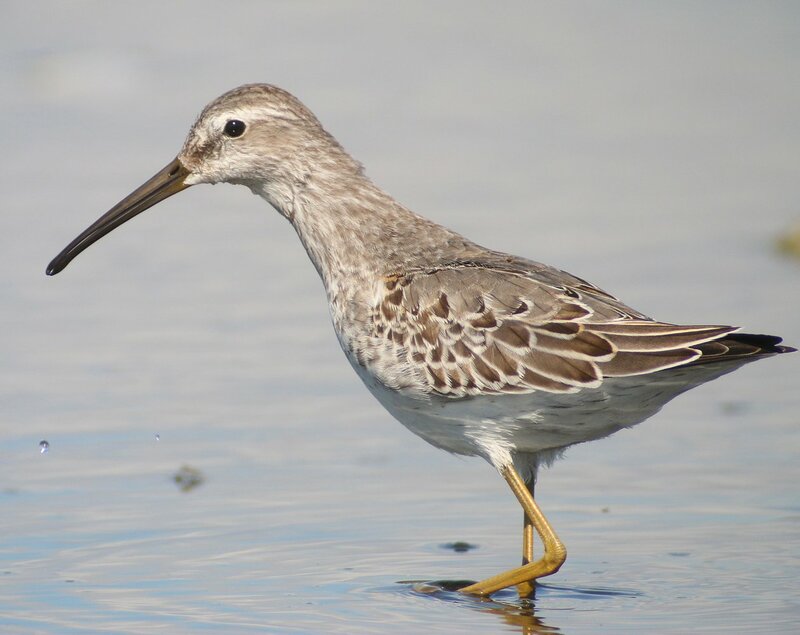 We’ve only had 1 Stilt Sandpiper in Melbourne (Aus.) since I’ve been birding so I really enjoyed seeing your close views. Holy close shorebirds! What a great day!